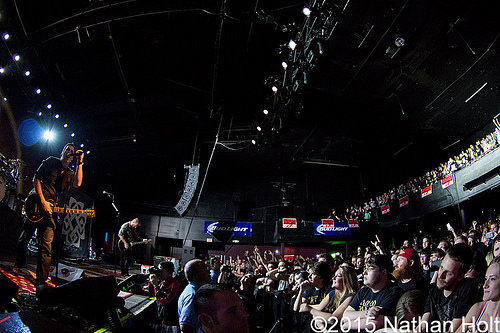 The Breaking Benjamin show at The Orbit Room in Grand Rapids, Michigan sold out very quickly. It’s hard to believe that most fans were unsure of the band’s fate after a brief hiatus a few years ago. When there were a few sightings of lead singer Benjamin Burnley playing acoustically, fans began to have a glimpse of hope for a reformation of Breaking Benjamin. Well, the wait is over. The band has emerged from its hiatus with Ben at its head and a few new faces filling in the vacancies: Aaron Bruch, Shaun Foist, Jasen Rauch and Keith Wallen. With new bandmates and only a handful of shows as a band so far, how will they compare to everyone’s previous expectations? After the next song, “Blow Me Away,” Ben thanked local radio station 97.9 WGRD for constantly playing the new single and for airing some great music around here. They then played a new song “Failure” from their upcoming album Dark Before Dawn. Everyone seemed familiar with it, singing along, but surprisingly the band didn’t further promote the album’s upcoming release on June 23rd. If interested, you can preorder it on iTunes, Google Play or Amazon Music. The newest members of Breaking Benjamin did an excellent job performing all the songs and also interacting with the crowd. They flawlessly pulled off “Breath,” “Phase” and “Away” which happened to be the next couple of songs. Then Ben dedicated the next song out to “all of your who have been with us for all these years. It’s a gift and it’s you guys that make this worthwhile, thank you so much.” It was the song “Shallow Bay” off their very first album, Saturate. Afterwards, they performed “Give Me a Sign” and immediately launched into a great cover of Metallica’s “Through The Never.” Sneaking in one of their oldest songs “Polyamorous,” they then went back to doing some more covers. “This one is for the empire” Ben told the crowd as they began to play “The Imperial March” theme from Star Wars. This was followed by a short medley of covers that included Tool’s “Schism,” Nirvana’s “Smells Like Teen Spirit” and “Walk” by Pantera. “Grand Rapids, Michigan! I cannot tell you honestly how great a crowd you were tonight. This show is going down in history right now, right here and right now. Breaking Benjamin is going to remember this and we cannot wait to come back again. We had an amazing time, you guys know how to rock!” Ben then rounded off the show with a motivational speech about the crowd being there for each other and for everyone to have a great rest of the night. With that, they jumped into “The Diary of Jane,” which was the final song of the evening. One thing was sure by the end of the night: No matter the view from where you stood during the show or how big of a fan you are, Breaking Benjamin is back and they sound as great as they ever have.